Radar instrument aboard a Japanese probe can spot signs of gas seeping from lakes that form as the ground thaws. In a 2,000-square-kilometre area around the Barrow Peninsula in northern Alaska, for instance, the team calculated that lakes release an average of 0.6 grams of methane per square metre of water surface each year — which equates to around 141 kilograms of methane per square kilometre. That is about 84% lower than some previous estimates based on measurements at individual lakes, Engram says, but lines up well with estimates based on atmospheric measurements. The potential for regime shifts and critical transitions in ecological and Earth systems, particularly in a changing climate, has received considerable attention. However, the possibility of interactions between such shifts is poorly understood. Rocha et al. used network analysis to explore whether critical transitions in ecosystems can be coupled with each other, even when far apart (see the Perspective by Scheffer and van Nes). ‘They report different types of potential cascading effects, including domino effects and hidden feedbacks, that can be prevalent in different systems. Such cascading effects can couple the dynamics of regime shifts in distant places, which suggests that the interactions between transitions should be borne in mind in future forecasts. ‘Abstract: Regime shifts are large, abrupt, and persistent critical transitions in the function and structure of ecosystems. Yet, it is unknown how these transitions will interact, whether the occurrence of one will increase the likelihood of another or simply correlate at distant places. We explored two types of cascading effects: Domino effects create one-way dependencies, whereas hidden feedbacks produce two-way interactions. ‘We compare them with the control case of driver sharing, which can induce correlations. Using 30 regime shifts described as networks, we show that 45% of regime shift pairwise combinations present at least one plausible structural interdependence. The likelihood of cascading effects depends on cross-scale interactions but differs for each type. Management of regime shifts should account for potential connections‘. Here you go, found the YouTube by scrolling down from Paul his Beckwith.net site, 2 youtubes with info and data that indeed, the methane sources can be found by looking at the surface concentration or taking the 1000 mbar readings, where it goes in the atmosphere and even some above can be tracked by looking at the concentrations at various airpressures, altitude. No more mystery, we can see where the methane comes from and where it is going, even where it is dying as in falling apart into CO2 and water, way up above close to heaven….. Seems the reservoir under the land and sea permafrost is leaking but not the 50 Gton yet. Nova Zembla used to be the barrier of the warm/wet golfstreamwinds and the polar cold and dry front, now the last 2 years, that front shifted to the end of the world, Yamal peninsula. With other words, the Kara sea has been lost to juicy warmth from the south. Fires that consumed a Japanese port in the wake of a 1993 earthquake-triggered tsunami were likely caused by methane gas released from the seabed during the tremor, a Japanese scientist said. On July 12, 1993, a magnitude 7.8 earthquake struck in the Sea of Japan, triggering a tsunami that crashed into Hokkaido and Okushiri islands in northern Japan, according to the U.S. Geographical Survey. As the monster wave hit the smaller outlying Okushiri, at least five boats moored in the island's Aonae Harbor simultaneously burst into flames. The tsunami waves and high winds drove the flames inland, where numerous buildings in the port were consumed by the fires. Enomoto noted that with the amount of methane gas buried beneath the seafloor off the coast of Japan, further analysis is needed to heed off potentially disastrous consequences from methane gas-triggered fires should disaster strike again. China introduced regulations requiring large reductions in methane emissions, but nonetheless Chinese methane emissions continue to rise rapidly. I guess just saying you will reduce methane emissions or saying the world can't warm more than 2°C isn't enough----countries have to do actually DO something. Abstract: "Abstract. Methane (CH4) is the second most important greenhouse gas, which atmospheric concentration is inﬂuenced by human activities. In this study, numerical simulations with a chemistry-climate model (CCM) are performed aiming to assess possible consequences of signiﬁcantly enhanced CH4 concentrations in the Earth’s atmosphere for the climate. We analyze experiments with 2xCH4 and 5xCH4 present day (2010) mixing ratio and its quasi-instantaneous chemical impact on the atmosphere. The massive increase in CH4 strongly inﬂuences the tropospheric chemistry by reducing the hydroxyl radical (OH) abundance and there by extending the CH4 lifetime as well as the residence time of other chemical pollutants. The region above the tropopause is impacted by a substantial rise in stratospheric water vapor (SWV). The stratospheric ozone (O3) column increases overall, but SWV induced stratospheric cooling also leads to a enhanced ozone depletion in the Antarctic lower stratosphere. Regional patterns of ozone change are affected by modiﬁcation of stratospheric dynamics, i.e. increased tropical up-welling and stronger meridional transport towards the polar regions. We calculate the net radiative impact (RI) of the 2xCH4 experiment to be 0.69 W/m2 and for the 5xCH4 experiment to be 1.79 W/m2. A substantial part of the RI is contributed by chemically induced O3 and SWV changes, in line with previous radiative forcing estimates. 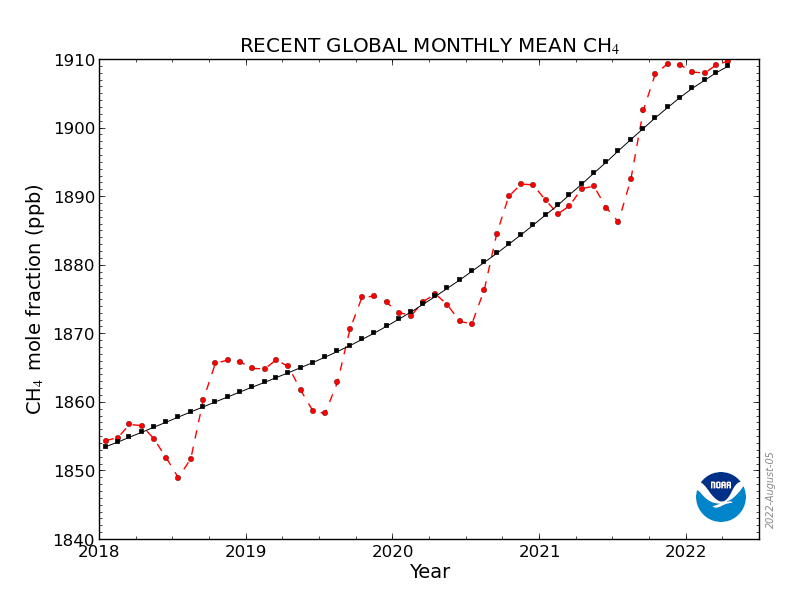 To our knowledge this is the ﬁrst numerical study using a CCM with respect to two/ﬁve fold CH4 concentrations and it is therefore an overdue analysis as it emphasizes the impact of possible strong future CH4 emissions on atmospheric chemistry and its feedback on climate." By some estimates, the Arctic permafrost contains enough carbon to nearly double the amount of CO2 currently in the Earth's atmosphere. A rapid meltdown would be disastrous because it could release a lot of CO2—in addition to methane, a powerful short-lived climate pollutant—to the atmosphere, where it would cause additional warming, said Ted Schuur, a permafrost expert at Northern Arizona University. The most dramatic warming was found in the Siberian Arctic, where temperatures in the deep permafrost increased by 1.6 degrees Fahrenheit. 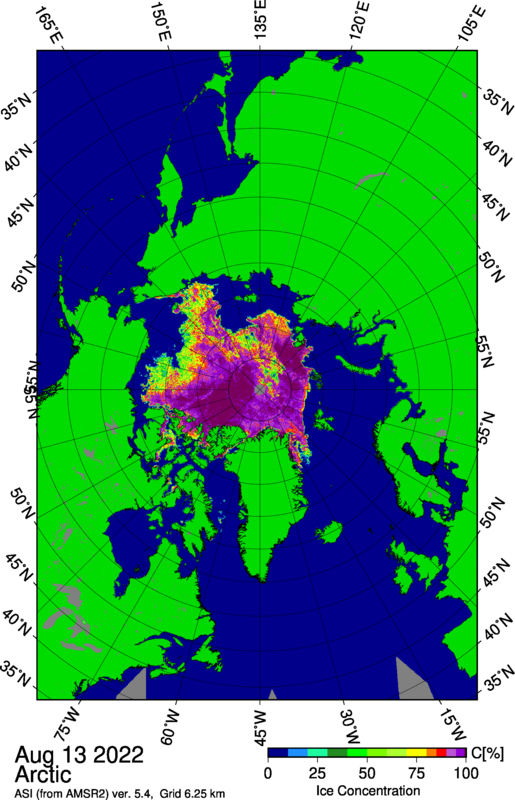 Most permafrost areas have been frozen since the last ice age, about 10,000 years ago. They trap vast amounts of carbon in layers of frozen organic soil up to a mile thick. "It's nice to get a quasi-global picture of permafrost change and how trends differ between regions and/or permafrost types," said Mathias Göckede, a climate researcher at the Max Planck Institute for Biogeochemistry who was not involved in the study. "As I see it, their findings basically confirm what has been estimated before, but provides more details and a more solid foundation." Very nice to get a quasi global picture but why not include the up to 10k Gton mix of free methane/hydrates beneath the subsea permafrost, now leaking as seen by various measurements? I thought the atmosphere holds about 5 Gton methane, surely bit more nowadays, 1% release of the lowest estimate subsea would be 20 Gton, 4 times over, enough to trigger abrupt CC, as we have seen, experience since this decade/end of last decade. Sea ice collapse, droughts, floods etc, Earth headed for a hothouse in a generation, not a century. Katey Walter Anthony, Thomas Schneider von Deimling, Ingmar Nitze, Steve Frolking, Abraham Emond, Ronald Daanen, Peter Anthony, Prajna Lindgren, Benjamin Jones, Guido Grosse. Ten years from now we will be able to look back at all these predictions being turned out by the "consensus scientific community" and in all probability more then half will be found to be totally wrong due to some error in the math or misunderstanding about what the observed data really means. When deciding which half will be found to be off the mark I choose the side that uses the most dramatic language to state their case and predicts the most disastrous results. Not very scientific of course but a better plan has alluded me so far. vt seems to be sure that essentially all scientists are completely corrupt money grubbers. millennia, not this decade (Schuur et al. 2015). and whether or not in time to reduce the climate impact. dohboi wrote: vt seems to be sure that essentially all scientists are completely corrupt money grubbers. I have a couple of scientists in the family plus have had professional dealings with a few more. All are driven by the publish or perish rule which is cast in concrete. Most do their best to bring good work forward but some of the most famous are famous because they have bent the rules to bring them to the top. It is just humane nature to do whatever it takes to win and scientists are just as human as the rest of us. It is foolish of us to just accept what the scientific community has declared the consensus. Following that rule the Earth is still the center of the universe and flat. I am a he by the way if anybody cares a whooptido. "...Most do their best to bring good work forward..."
in the strangest of places if you look at it right..."
That has to be one of the most assinine statements posted here in quite a while. Just because people hawking a bronze age religion through a crudely edited book of rules denied science, doesn't make it true especially since the book was assembled long after the ancient Greeks deduced the correct answer. Ampelius, Chalcidius, Macrobius, Martianus Capella, Basil of Caesarea, Ambrose of Milan, Aurelius Augustinus, Paulus Orosius, Jordanes, Cassiodorus, Boethius, Visigoth king Sisebut. Isidore of Seville, Beda Venerabilis, Theodulf of Orléans, Vergilius of Salzburg, Irish monk Dicuil, Rabanus Maurus, King Alfred of England, Remigius of Auxerre, Johannes Scotus Eriugena, Leo of Naples (in German), Gerbert d’Aurillac (Pope Sylvester II). Notker the German of Sankt-Gallen, Hermann of Reichenau, Hildegard von Bingen, Petrus Abaelardus, Honorius Augustodunensis, Gautier de Metz, Adam of Bremen, Albertus Magnus, Thomas Aquinas, Berthold of Regensburg, Guillaume de Conches, Philippe de Thaon (in French), Abu-Idrisi, Bernardus Silvestris, Petrus Comestor, Thierry de Chartres, Gautier de Châtillon, Alexander Neckam, Alain de Lille, Averroes, Snorri Sturluson, Moshe ben Maimon, Lambert of Saint-Omer, Gervasius of Tilbury, Robert Grosseteste, Johannes de Sacrobosco, Thomas de Cantimpré, Peire de Corbian, Vincent de Beauvais, Robertus Anglicus, Juan Gil de Zámora (in Spanish), Ristoro d'Arezzo, Roger Bacon, Jean de Meung, Brunetto Latini, Alfonso X of Castile. Marco Polo, Dante Alighieri, Meister Eckhart, Enea Silvio Piccolomini (Pope Pius II), Perot de Garbalei (divisiones mundi), Cecco d'Ascoli, Fazio degli Uberti (in Italian), Levi ben Gershon, Konrad of Megenberg, Nicole Oresme, Petrus Aliacensis, Alfonso de la Torre (in German), Toscanelli, Brochard the German (in German), Jean de Mandeville, Christine de Pizan, Geoffrey Chaucer, William Caxton, Martin Behaim, Christopher Columbus. None were scientists ,just people who knew of the works of the ancient greeks and romans. As for being the center of the universe. Well that one comes with a very large grain of salt, (probably the size of Rigel). Until the 20th century nobody had the needed instruments to be able to see AND measure anything outside the local quadrant of the milky way. Until Edwin Hubble nobody could determine what Andromeda actually was,even though you can see it with the naked eye. It took the 100inch Mt Palomar telescope to give the resolution to begin to form the ability to see far enough with enough precision to understand how vast the universe was, combined with Einstein's General Relativity, to understand what how the universe was structured and worked. Right now most astrophysicists will tell you there is NO center of the universe. So the center of the Universe comment is not a question unless you deny science, according to modern cosmology, it is a moot question with no meaning. How cathartic it is to give voice to your fury, to wallow in self-righteousness, in helplessness, in self-serving self-pity. You are forgetting or at least ignoring the history of Christianity that destroyed or repressed much of the worlds existing knowledge going so far as to burn whole libraries of ancient text. They then replaced it with the bible and the Garden of Eden etc and brought on the dark ages. Are you also forgetting the middle ages astronimers that were pursicuted for saying the earth was not the center of the universe? Here is a question for you. If Colombus was so well informed about the shape of the earth why did he not measure the distance north to south it takes to change the angle to the north star a degree or five and then compute the circumferance of the earth thus knowing how far he would have to sail to get to China sailing west? He arrived in the Carribean thinging he was in India. Big mistake don't you think? Columbus thought he reached India by sailing west from Europe, and that somehow proves that he didn't think the world was round??? You're really going off the rails here, vt. Maybe lay off that backwoods hooch for a while!? His error was not about the shape of the earth it was about the size. Point being the depth of ignorance in even the most "enlightened" people of his day. Across the Arctic, lakes are leaking dangerous greenhouse gases. And one lake is behaving very strangely. If Colombus was so well informed about the shape of the earth why did he not measure the distance north to south it takes to change the angle to the north star a degree or five and then compute the circumferance of the earth thus knowing how far he would have to sail to get to China sailing west? Very simple Columbus used figures from people who assumed the Eurasian land mass was larger then it turned out to be and the earth total was smaller then it actually is. His inaccuracy lead the Portuguese government at the time to reject his idea because they had a better data of both sizes and felt the route they were using around the horn of Africa was the better route.The Spanish government had not as accurate data and were seeking a way to gain an advantage from the Portuguese, hence their support for Columbus. interesting for someone who wants to claim superiority by calling people out for their posts YOU would not know that simple fact.